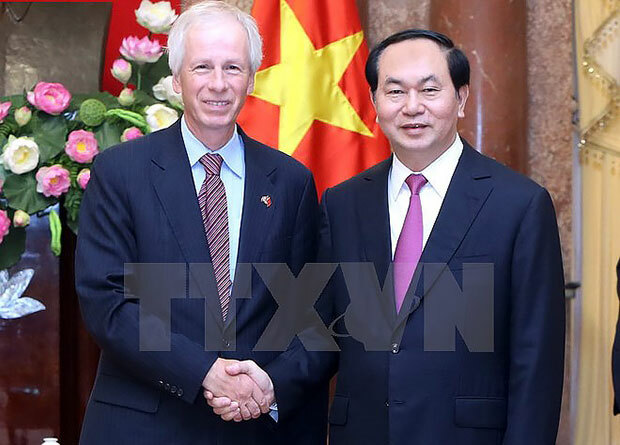 Vietnam wishes to enhance the multi-faceted cooperation with Canada, President Tran Dai Quang told visiting Canadian Foreign Minister Stephane Dion in Hanoi on September 5. He affirmed that Vietnam stays ready to work together with Canada in order to deepen the relationship in a pragmatic and effective fashion, for interests of the two countries’ people, and for peace, stability and cooperation in Asia-Pacific and the world as well. The head of State appreciated Canada’s commitments to continuing its official development assistance (ODA) for Vietnam as well as its support for the country in climate change response, poverty reduction and food safety. He thanked Canada’s 15 million CAD (11.6 million USD) aid package announced by Stephane Dion during his ongoing visit to help Vietnam implement a climate change project. The President expressed his hope that the Canadian Parliament will soon ratify the Trans-Pacific Partnership (TPP) agreement to promote high-standard free trade in the region. The two countries should step up their political, economic, trade and investment ties while expanding people-to-people exchanges and collaboration in national defence and security, crime combat, and education-training, he suggested. For his part, Minister Stephane Dion briefed his host on the foreign policy of Prime Minister Justin Trudeau’s Liberal Party that aims to tighten its connectivity with Asia-Pacific and strengthen its relationship with Vietnam, while attaching importance to the role played by the Association of Southeast Asian Nations (ASEAN). Canada sticks importance to and appreciates regional multilateral mechanisms and forums such as the Asia-Pacific Economic Cooperation (APEC), the East Asia Summit (EAS) and the ASEAN Defence Ministerial Meeting Plus (ADMM+), the minister said, noting that Canada wishes to fully and actively engage in such mechanisms. Canada will support Vietnam in hosting the APEC 2017, he promised. Host and guest compared notes on the settlement of disputes in the East Sea by peaceful measures, with respect for diplomatic and legal processes and in accordance with international law, including the 1982 UN Convention on the Law of the Sea, in order to maintain peace, stability, security, and maritime and aviation freedom in the sea. They also underlined the need for relevant sides to seriously observe the Declaration on the Conduct of Parties in the East Sea (DOC) and conduct pragmatic negotiations on a Code of Conduct in the East Sea (COC)./.